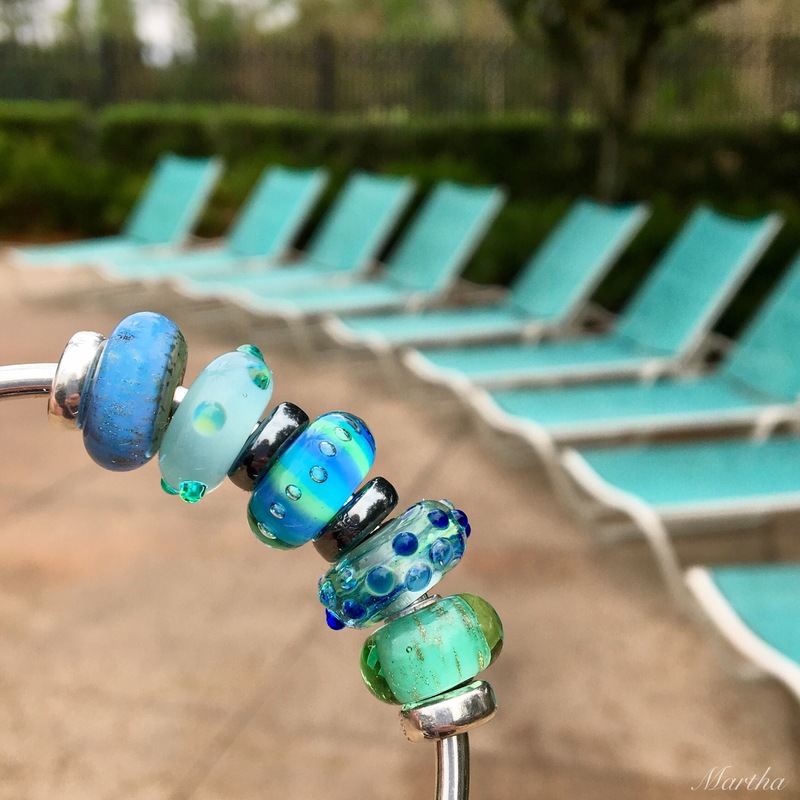 I am forever wearing spacers between glass beads. I find with the separation the eye can better appreciate the glass beads. Sometimes it’s fun to divide the beads into little groups. 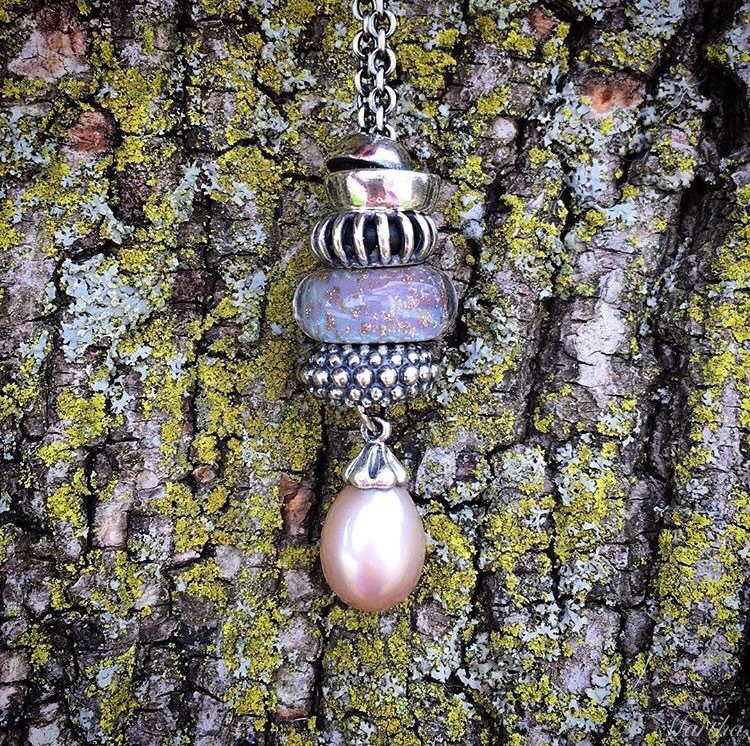 They fit nicely on a Fantasy Necklace. Making a little area to add a dangle also works. Here are a final few photos. 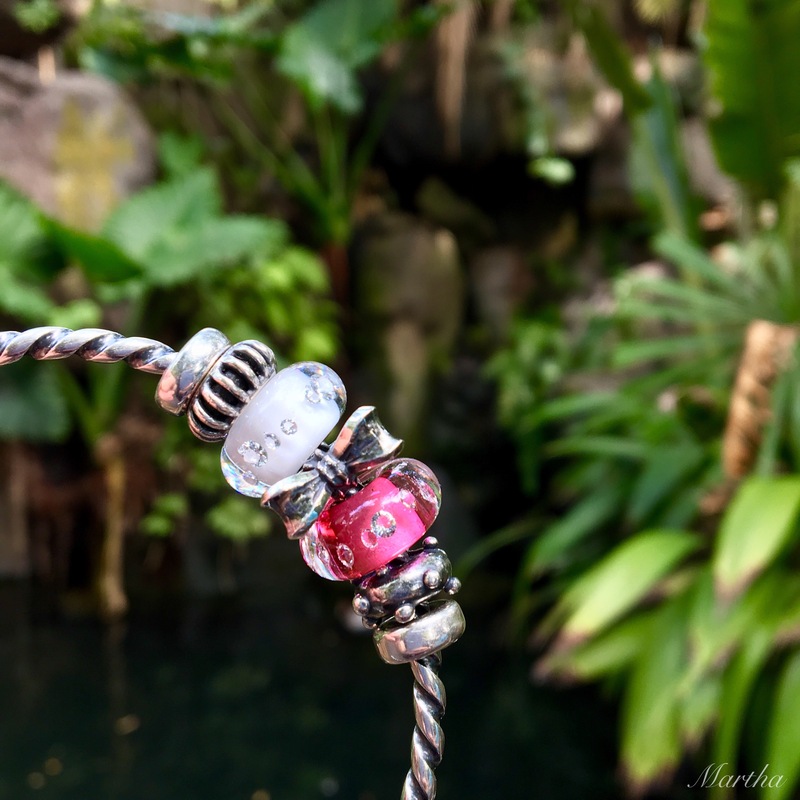 Coming up tomorrow is an Egypt Inspired with Redbalifrog post, then Friday will be an Ohm Beads Grumpy Cat giveaway to help celebrate the 2nd Annual Ohm Gnome Festival. LOL! Hi Martha, I get so many wonderful ideas from you! 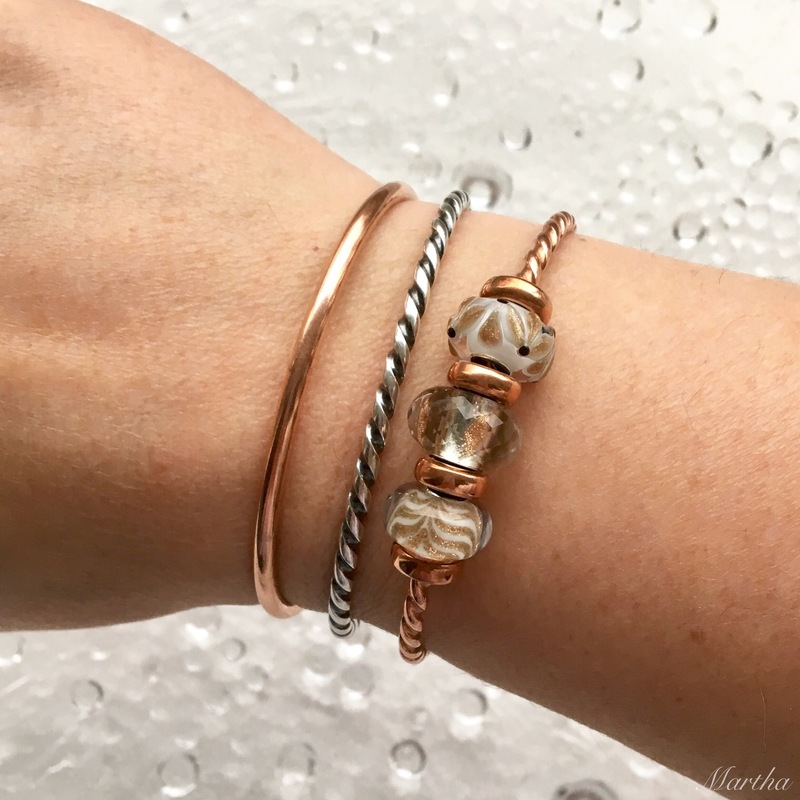 My absolute favorite combination you’ve done here is the two copper bangles and the twisted silver bangle. I know at least two of the beads are from the Winter Wonder Kit…not sure about the middle one. I am really in need of more spacers! I happened to get two of the Redbalifrog Star stoppers yesterday. 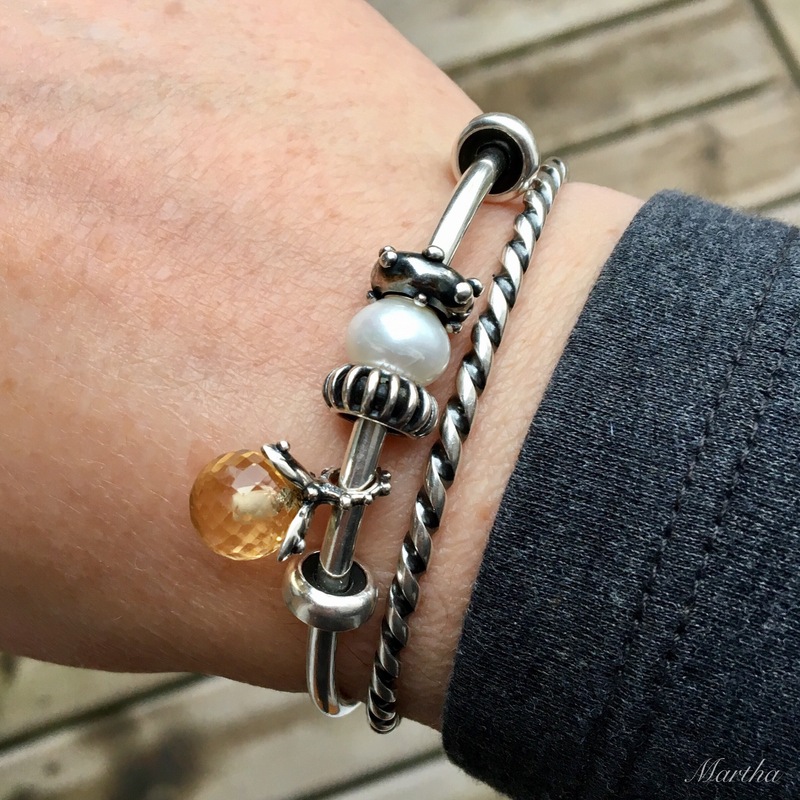 I wanted to put them on one of my Trollbeads bracelets and…long story short,.. they’re on there so tight now that bracelet will never be taken apart! Luckily, I like it. Hi Suzanne! That middle bead on the copper is called Daylight Brilliance and was released last fall as a Limited Edition during the American Black Friday. I don’t think there’s anyone who has enough spacers! 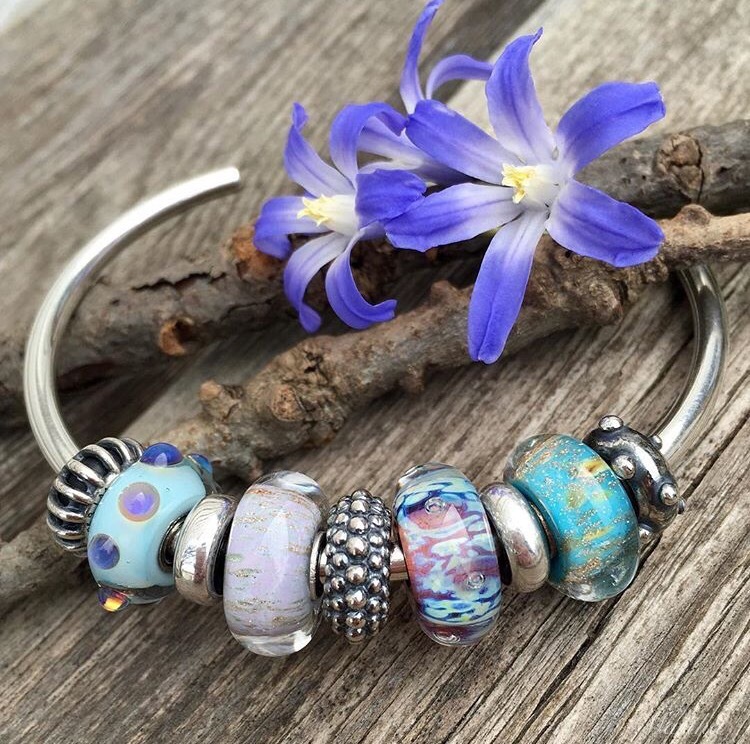 An Instagramer named Laura justed posted the most fabulous photo of a bracelet of assorted stoppers. If you search @evepink123 and go back a couple of photos you can see it. Now I REALLY need more stoppers! 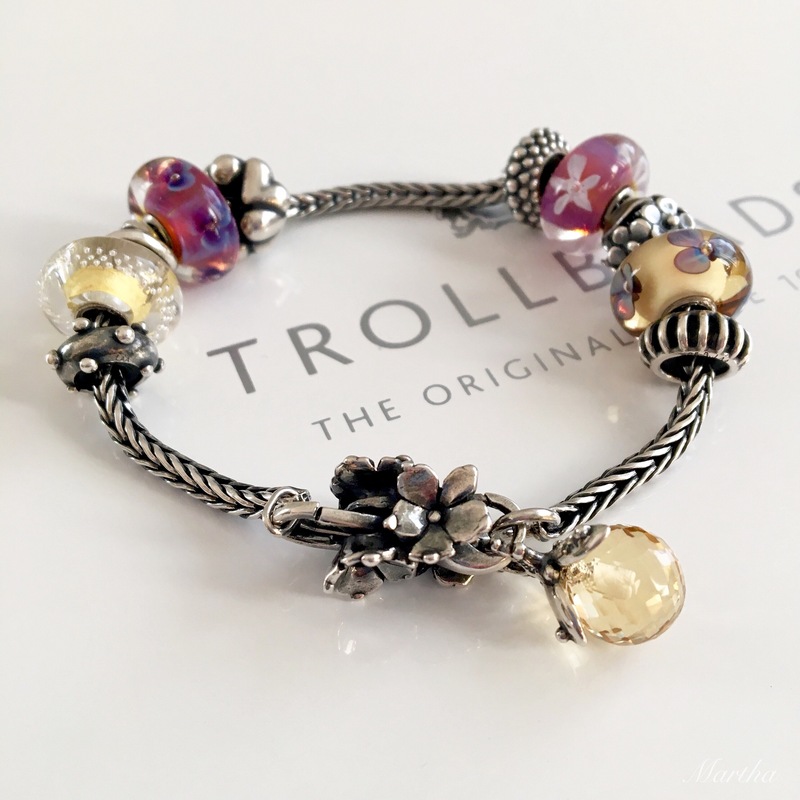 I just checked and my Hawaiian Floral ones and Snowflake ones fit Trollbeads bracelets just fine but my Star Stopper Brass ones do not! That’s interesting. Thank you very much for checking, Martha. I do want to get the Hawaiian Floral and the Snowflake ones, so now I don’t have to worry. Well, I wouldn’t count on that necessarily in case something has changed since I got them. But they do fit for me. So the very last picture has a Blue Desert-it’s to the right of the Connected Love Spacer. I bought it from a live image online because I liked how it was kind of an unusual colour. 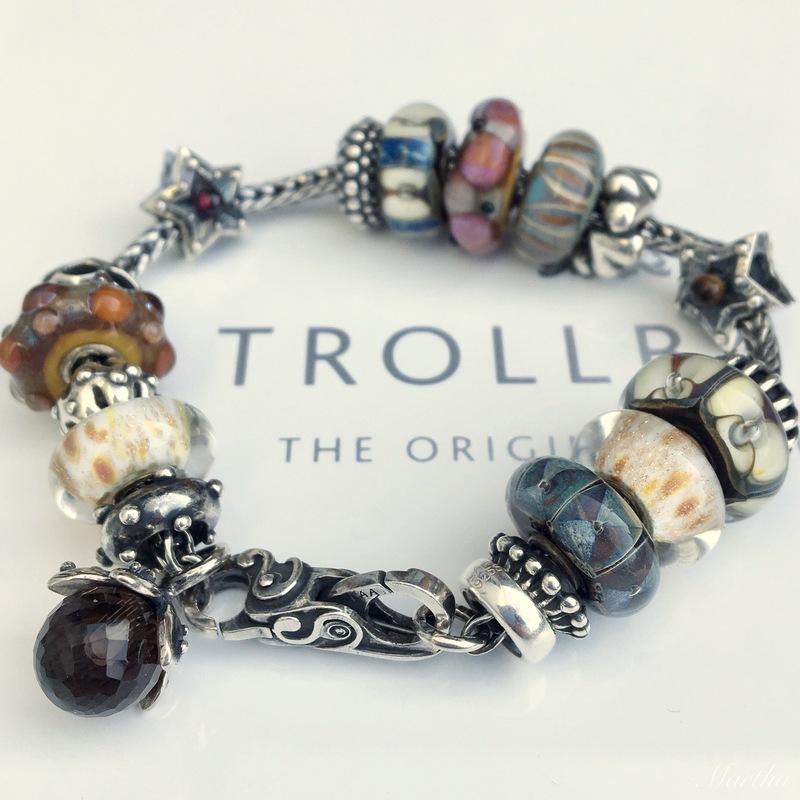 I agree that Trollbeads makes such a great use of glitter. 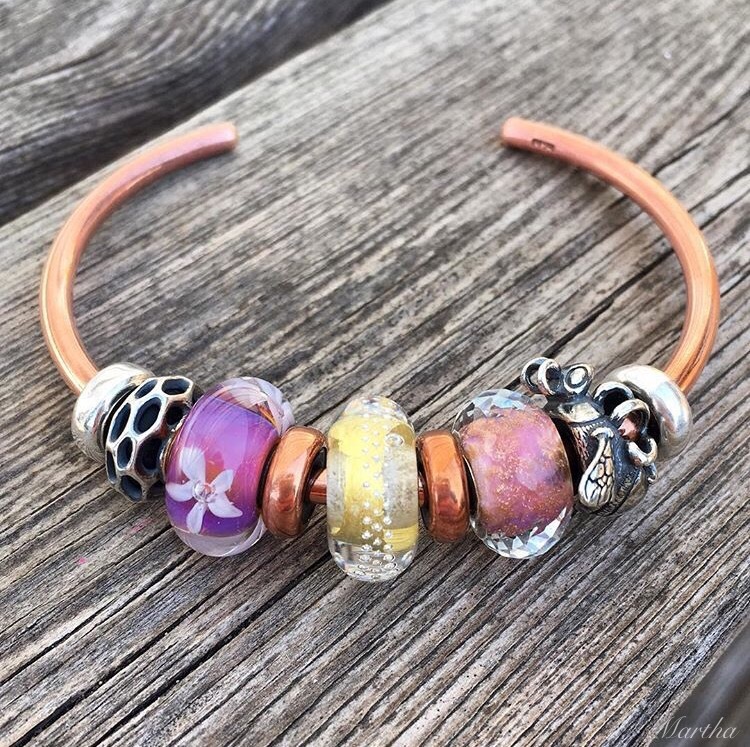 I’m such a sucker for glittery beads and am trying not to look at the new Pandora Muranos that have glitter in them, LOL! Ooh you picked a good blue desert- I would go for that type of blue to if I get one. 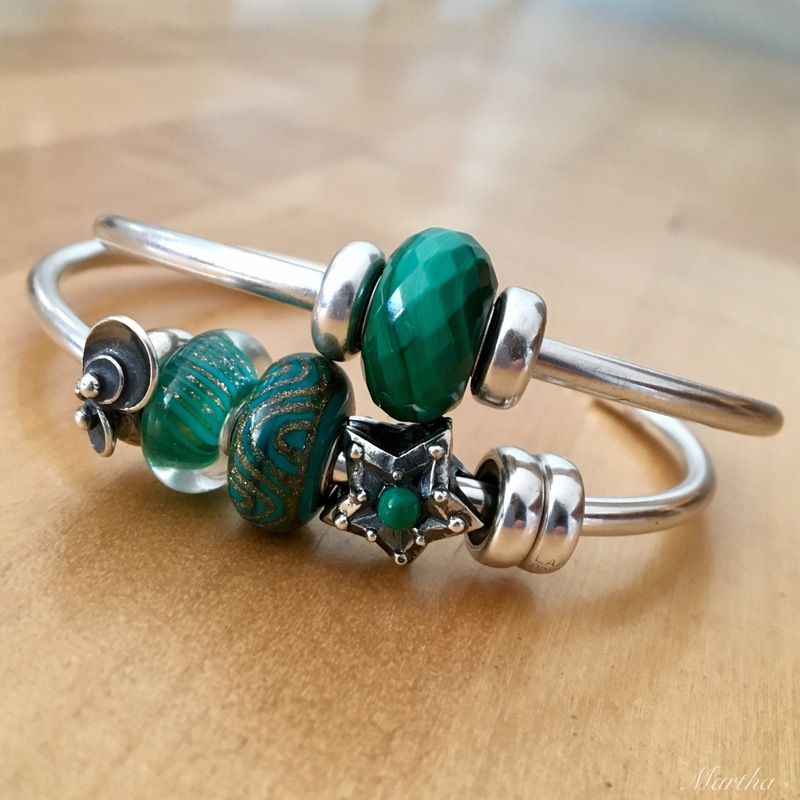 Yes the new Pandora glass reminds me of tb ( in a good way) and yes I love the mint one. Do you think you will indulge in either ??? 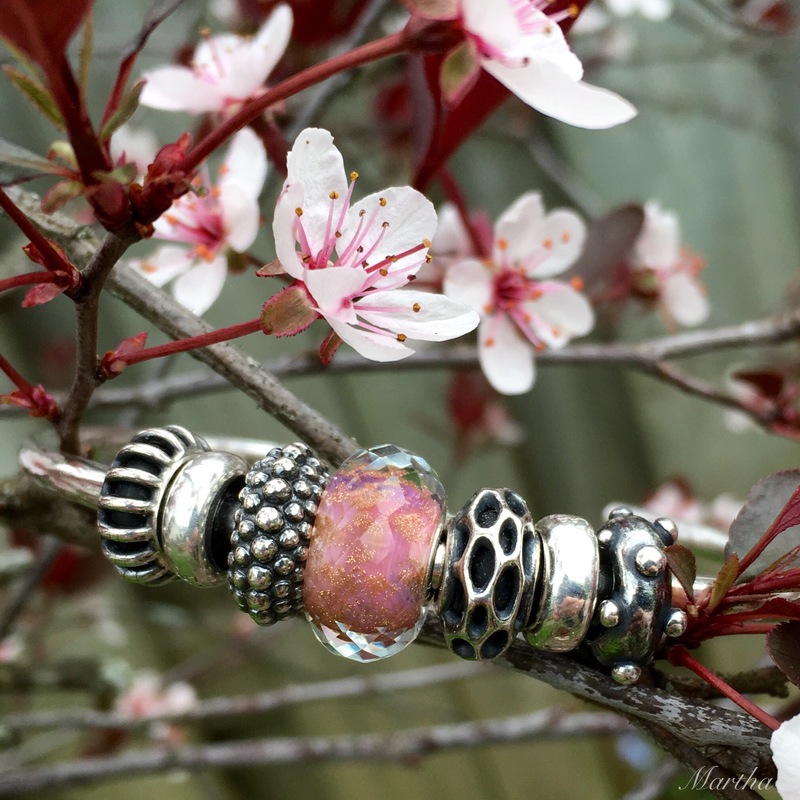 No, I recently bought two of those bright orange faceted Pandora beads (old ones) and two Summersday beads and two gold Trollbeads stoppers so I am on a major bead ban! Hi Martha! I haven’t had a chance to comment much recently, but have followed every post and as usual love everything you’ve done. 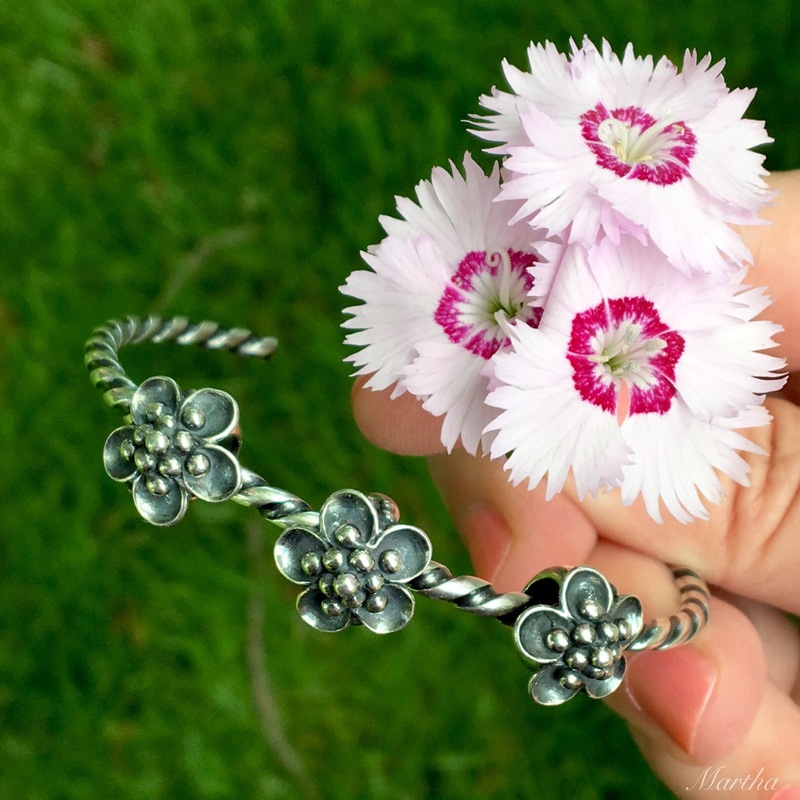 I love your photos of beautiful bracelets with beautiful flowers and rustic wood. I really need to try some of your designs with the separate stations as I really like the look as in the one you have laid out in a heart shape and the one below it. They look so cool! I love spacers since they stay put. 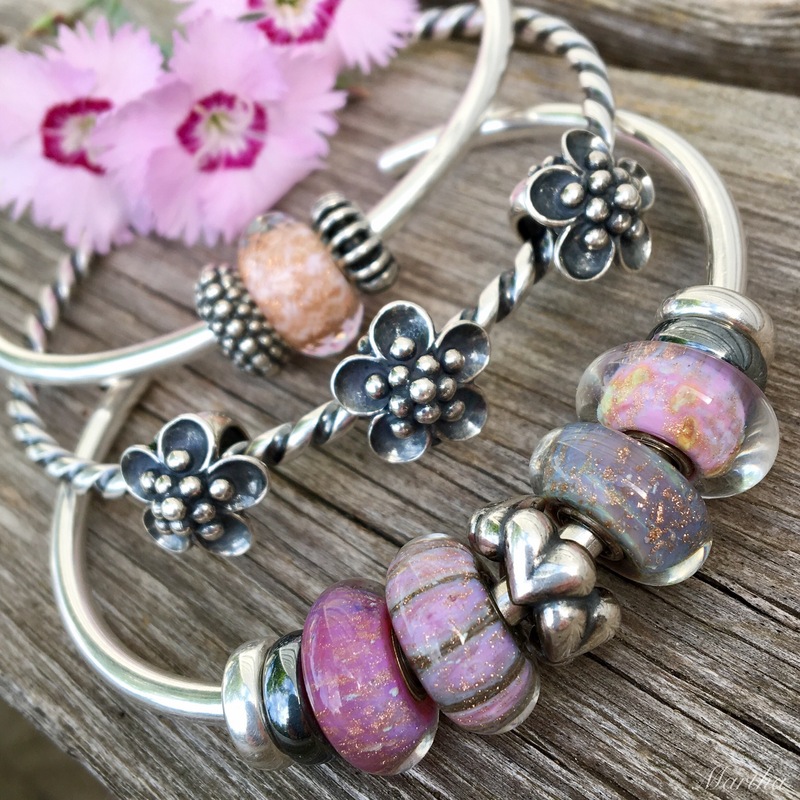 It’s always a challenge not only to design, but to contain the design if it’s not a fully loaded bracelet. 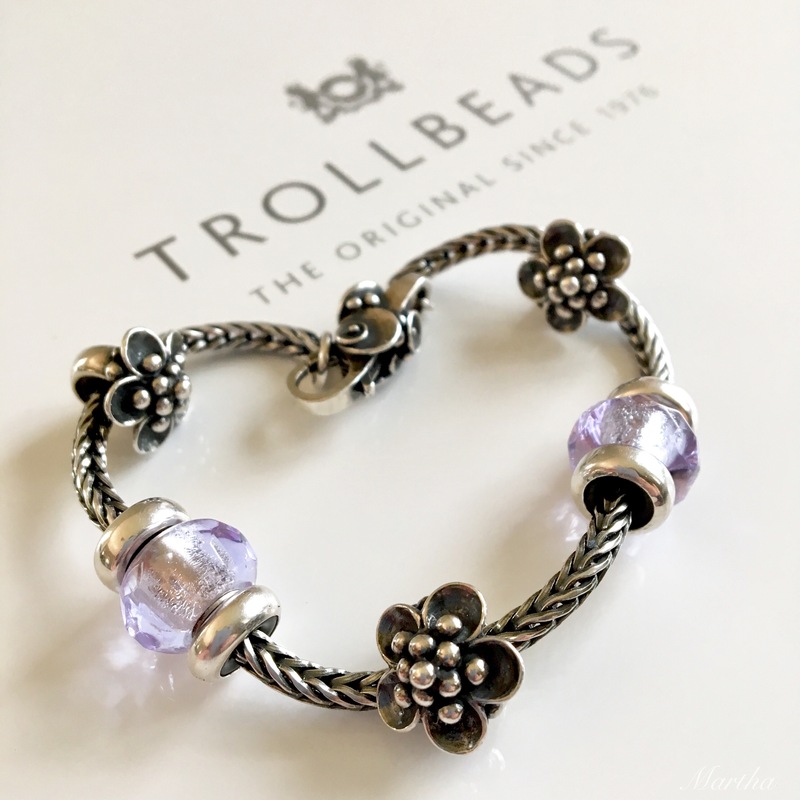 I would like to see Trollbeads come out with some spacers sized and shaped like the plain ones, but with some kind of design or etching on them. Hi Dawn! Oh, that would be nice, wouldn’t it? I quite like using spacers as a decorative element, especially if I don’t want to wear a lot of glass. 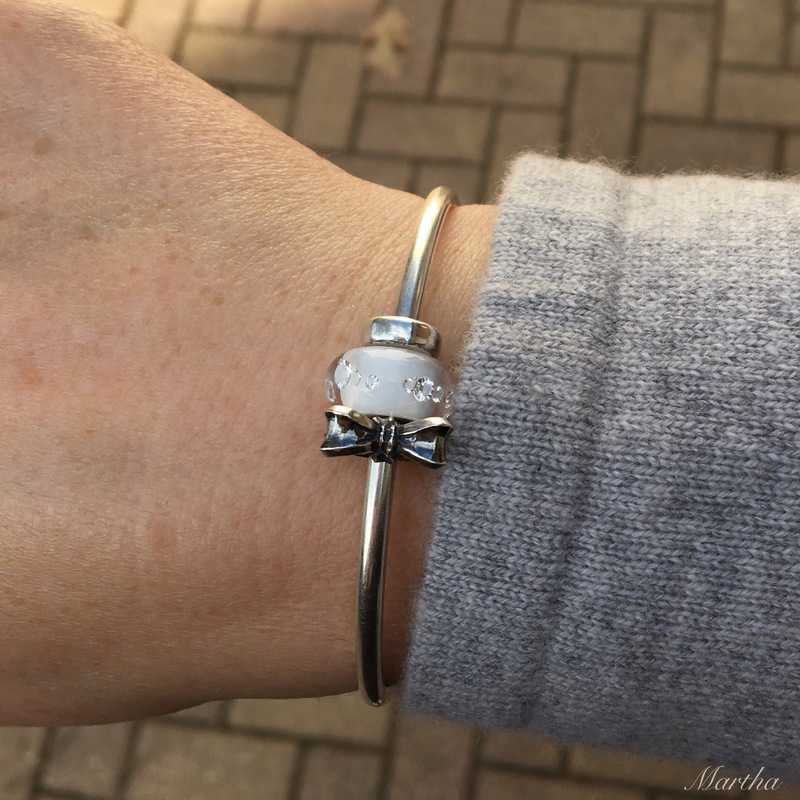 The plain ones are so great for holding silver True Beadz on a bangle, I find. One could spend an entire day making up combos with spacers!